Car wash for buses and vehicles | TEZAS servis a.s. 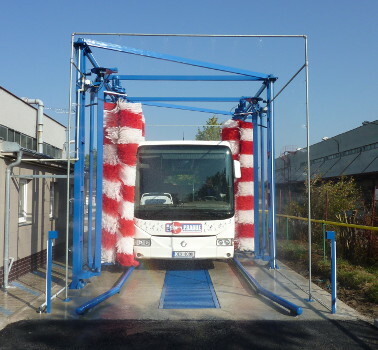 Within our servicing centre, in Prague 9 – Satalice, customers are welcome to make use of a fully automatic and unattended vehicle wash for the washing of buses and trucks, including trailers. The car wash greatly decreases the amount of time spent washing buses or vehicles. The car wash is a drive through with brushes. To ensure a perfect wash of your bus or vehicle, four brushes, each equiped with its own motor, are hung on the car wash‘s main structure. The brushes wash the front, side and back of the bus while it slowly goes through the car wash. The soaking and rincing of the bus is done by two moving frames. The first frame works to soak the bus, the second then rinses the bus off. Traffic lights at the start of the car wash ensure that only one bus or vehicle enters at a time.